Wake up to a hot, delicious bacon and cheese omelet full of the nutrients needed to start your day right. 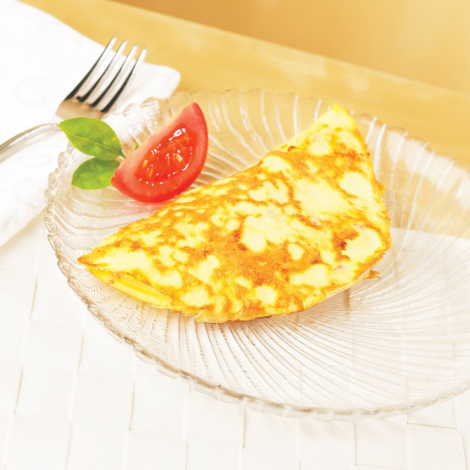 Use Bari Life Bacon Cheese Protein Omelet Mix to make a hot, tasty and low fat breakfast. When you start a low-calorie and low-fat diet you’re likely saying goodbye to bacon, but not if you choose Bari Life Bacon Cheese Protein Omelet Mix! Say hello to a delicious bacon cheese omelet that’s not only great-tasting but, high-protein and low-carb breakfast for only 100 calories! Add in 15 grams of protein and you’re setting yourself up for an energized morning and more weight loss. Make your hot breakfast on the stove or in the microwave in minutes with no need to crack eggs or fry bacon. Enjoy it on its own or toss in some spinach for a few more nutrients. Suitable for the Pre Op and Post Op Puréed, Solid Foods, Weight Loss and Maintenance diets. Also a great choice for gastric sleeve, gastric bypass, duodenal switch and gastric band patients. Super easy preparation makes enjoying this high protein breakfast even better. Bari Life protein omelets are a fantastic morning breakfast option for anyone watching their weight and they are perfect for people on-the-go because they are light and easy to take with you anywhere. Especially great for camping and backpacking since they have 15 grams of filling protein! Great for breakfast, lunch, or even dinner and snacks! For guidance on how to use this item as part of a healthy weight loss plan click here view our Bariatric Diet Plan. Whey Protein Concentrate, Eggs, Egg Whites, Textured Vegetable Protein (Soy flour, caramel color, and FD&C Red #3), Natural Flavors, Salt, Yeast Extract. Contains less than 2% of the following: Soybean oil, Beta-carotene color (maltodextrin, gum acacia, sucrose, vegetable oil, sodium ascorbate, beta-Carotene USP, di-alpha-tocopherol, silicon dioxide [anticaking agent]), Tomato powder, Onion powder, Garlic powder, Spices, Sunflower oil (anti-dusting agent), Soy Lecithin. I’m okay with the texture but there is something in there that just isn’t right. I think it might be the bacon flavor. I have six more of these to eat. I’m going try dressing it up with some spices. I was hopeful on this for texture pre-op but the taste was so bad I ended up tossing them all after trying it the second time. The texture and taste is crazy bad. I love eggs, however this is no egg. The flavor if you can eat it all when it is hot enough can pass for eggs. However, the texture is no good. I do not even know how anyone got that picture with this egg powder. Maybe if you can add some cheese or something to bind it together it would be okay. Pour contents of one packet into 2.5 oz to 3.7 oz of water. Stir with fork. Cook in a nonstick frying pan on medium-low heat for 2-3 minutes or until desired consistency. Cook for approximately 1 minute, stirring every 15 seconds or until desired consistency.